On Reva’s fourth birthday, her dad mysteriously vanished. In the months that followed, the United States was terrorized by a group of real-life supervillains called the Fiendish Four. Until the Fiendish Four vanished just as mysteriously. Reva has always felt that these events were somehow linked to the last gift she ever got from her dad—his vintage collection of Pocket Protectors (action figures you wear on your pocket). 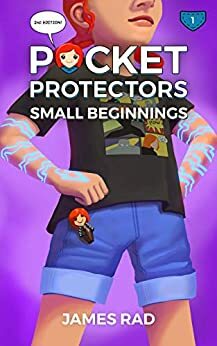 While celebrating her twelfth birthday with friends at Comic-Con, Reva stumbles on a Pocket Protector that gives her the power to teleport and time travel. The rare find gets her locked up by an evil toymaker with immediate plans to unleash new real-life baddies on the world. There’s only one way Reva can escape the toymaker’s prison, break free of a crippling anxiety, and save the day: she must investigate a traumatic timeline and discover her true powers that lie within. My dad got me this book for my birthday and I started it that night. Now it is my favorite book. I like how Reva gets the powers of her favorite comic book character. HOAP is kind of silly. Pocket Protectors is awesome because Reva get special powers. I also really like Pocket Protectors because HOAP, is kinda crazy. You should read this book because it is awesome, interesting, crazy, funny and exciting. I didn't like it... I loved it! 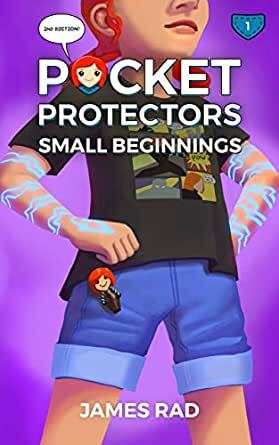 The book Pocket Protectors was so amazing. I loved the book so much that I was inspired to dress up as Reva, one of the main characters in Pocket Protectors. I also made my own Re-Lo because she has awesome super powers. I love the imagination and creativity in the characters. He is a really good writer and gives a lot of good details. You should really read the book. I would give it 5 stars. I can't wait to read book 2 in the series!